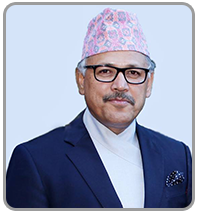 Dr. Arjun Kumar Karki is the Ambassador Extraordinary and Plenipotentiary of the Government of Nepal to the United States of America. Dr. Karki is also Ambassador-Designate to Columbia, Coasta Rica, Guatemala, Honduras, Nicaragua, Mexico, and Guyana.Dr. Karki has more than 20 years of experience in international relations, international diplomacy, international negotiations, conflict mediation, peace-building as well as development co-operation at the local, national, regional and global levels. He has undertaken the International Diplomacy and Leadership Training from Harvard Law School, USA; the International Diplomacy and Diplomatic Protocol Management Training from EUROPROTOCOL, UK and the International Negotiations: Practical Skills and Techniques Training Course from The United Nations Institute for Training and Research (UNITAR). Prior to his incumbent role, Dr Karki had been holding the position of International Co-ordinator of LDC Watch that is legally based in Brussels, Belgium with the international headquarters in Kathmandu, Nepal. He was co-ordinating the organisation and mobilisation of the LDC Watch civil society policy advocacy and campaigns in the 48 UN-defined least developed countries (LDCs) in Africa, Caribbean and the Asia-Pacific. His work entailed well-established collaborative relationships with the UN system; the European Union viz. Council of Ministers, European Parliament, European Commission; the Organisation for Economic Co-operation and Development (OECD); the African Union (AU); the South Asian Association for Regional Cooperation (SAARC) and the Pacific Islands Forum. Dr. Karki was actively engaged in Nepal’s democracy movement in 1990 having been rooted in student activism during the preceding Panchayat era. Throughout the Maoist conflict (1996-2006), he was intensively involved in conflict mediation, conflict transformation and in defending the development space as the President of NGO Federation of Nepal, the Regional Co-ordinator of the South Asia Alliance for Poverty Eradication (SAAPE) while also heading Rural Reconstruction Nepal (RRN). He played a noted role as a human rights defender at the national and international levels – especially at the United Nations (UN) and European Union (EU) – during the ‘direct royal regime’ in 2005 and subsequent second democracy movement or Jana Andolan II in April 2006. Dr. Karki earned his PhD in Development Studies from the University of East Anglia, UK and worked as an International Fellow at The London School of Economics and Political Science (LSE), UK. He has published works of international repute and academic credentials including undertaken peer review for the Oxford University Press and SAGE Publications.